Many Marlovians who have been shod for generations by Clark's shoe shop in the High Street will be saddened by its demise. Sorbon, part of the Shanly organisation, has acquired this property and the adjacent White House. 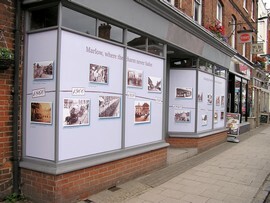 We were asked by Sorbon if we could supply some pictures charting our High Street through the ages. With the help of Michael Eagleton and Barry Lea a pertinent selection was found and swiftly converted into the vinyl covers that now face the shop windows. It did not take long for someone to tell us that the Ford Anglia with the reverse sloping back window and the Minivan could not have been in the street in 1955 as they were post 1959 models. There are doubts of the dates of many of our pictures but this shows that clues are there if you have the knowledge. This is a good example of co-operation between the Society and the major property owner in Marlow. We will seek other similar opportunities whilst strictly maintaining our independence. The property is now occupied and the display removed.